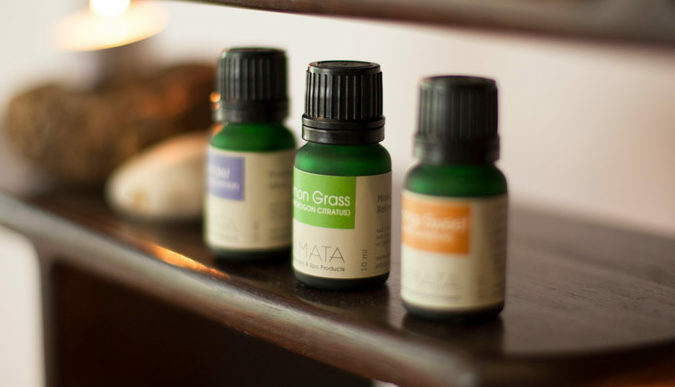 The Sâmata Aromatherapy line is comprised of specifically selected oils that provide healing in a range of areas. These oils are 100% pure and natural, extracted from their sources by the appropriate methods of either cold pressing or steam distillation. They are of the highest, concentrated quality and should be treated as such, being careful never to use directly on the skin without a carrier oil or the advice of our aromatherapist. To diffuse: Add five drops of water to one drop of essential oil into burner. With its warm, woody aroma, Cedarwood has a grounding effect. It calms and relaxes, and is a useful respiratory aid. Diffusing or massage is recommended. The bright notes from this oil are an instant mood booster, working as a mild antidepressant. Its properties also act as an insect repellent and antibacterial. This strong scented oil has equally strong healing properties that can improve respiratory functions, and alleviate mental exhaustion. 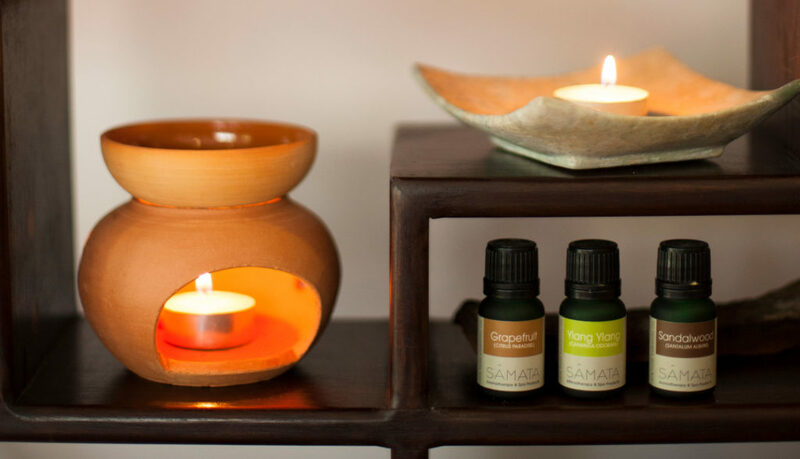 A common and calming fragrance, Sandalwood helps reduce stress and improve concentration. It can also be used to help reduce spasms and sooth irritated skin. The citrus oil has many health benefits, including being detoxifying, boosting and a natural insect repellent. antiseptic properties. With a deeply floral fragrance, this is one of the most revered oils for relaxation and sleep aid. It also has antibacterial and skin soothing properties, making it commonly used as a topical ointment. The bright aroma from lemongrass has a mood stabilizing effect on the mind, as well as helping to balance the nervous system. It’s a natural pain reliever, digestion enhancer, and anti-inflammatory. One of the world’s oldest medicines, peppermint oil is proven to reduce headaches, muscle aches, inflammation, respiratory distress, fever, oral bacteria, and fatigue. Widely used in hair and skin care products, Ylang Ylang has exceptional healing abilities for skin irritation. The relaxing and romantic floral notes of this oil are also beneficial in reducing stress and muscle tension. Being a topical cure-all for diseases and infections makes this a staple oil for everyone. Its exceptional properties include being antimicrobial, antibacterial, antiviral, antiseptic, and anti-inflammatory. The mildly tart aroma relieves mental fatigue and revives the senses, while the metabolic properties aid in weight loss and overall detoxification. One of the more powerful antidepressants, orange essential oil works to improve cognitive function and mood. It is equally effective as an antiseptic and antispasmodic, relieving muscle spasms. 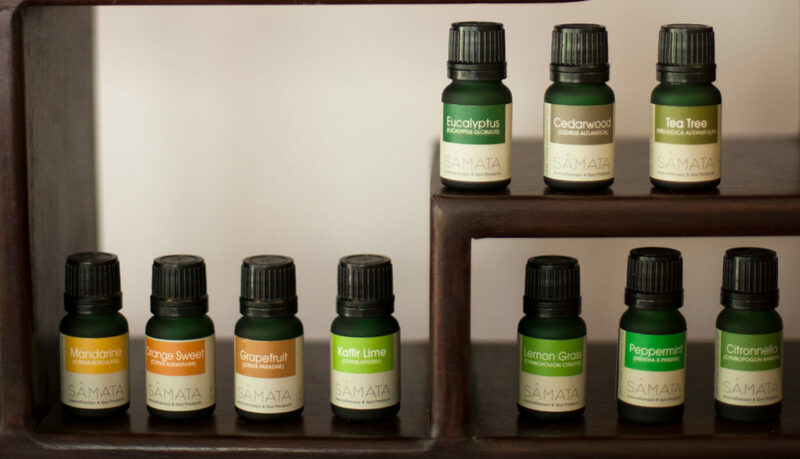 Balanced with 100% pure and natural essential oils, those blends have been designed by SÂMATA. Calming, relieves anxiety and stress, promotes a restful sleep. Improves mental clarity, alertness and concentration. Warm and spicy scent. Mood uplifting, purifying the air. Sweet and sensual floral scent, aphrodisiac, sharpens the senses. Relaxing, promotes a peaceful state of mind.